Aware of mold’s vicious cycle and sensitive to a homeowner’s distress and health concerns, we understand that mold is a quiet but very real emergency. We recognize that the invasion of mold not only eats away at property, but can jeopardize human health, and we do whatever it takes to remove this hazard with minimal disruption to the occupants. Our mold remediation process benefits property and people. PuroClean specializes in mold remediation. As a mold remediation company, we do not provide mold testing services. The company that does your mold testing should not do the remediation. 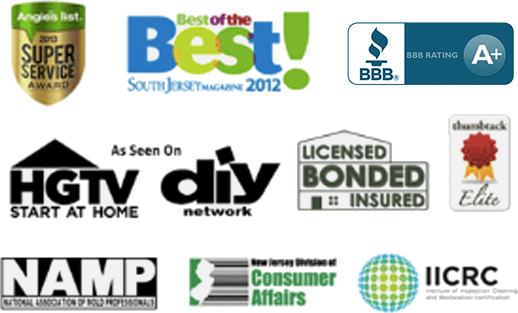 While we work will many Indoor Environmental Professionals (IEP) who do provide testing services, it is an industry conflict of interest for one company to do the mold testing and then do the remediation on the same home/business. Some companies provide both testing and remediation services together, but homeowners/business owners should be aware that a conflict of interest does exist. If you are unsure if you have a mold problem (if you can not see the mold), or if you have a large scale mold problem, the services of an Indoor Environmental Professional (IEP) should be employed. Smaller areas of concern do not always necessitate the need for an IEP. An IEP can provide a thorough inspection, conduct testing, and provide a protocol for remediation. Additionally, after the remediation process is completed, the IED should come back to conduct a post test (or clearance test) to verify that the mold was properly remediated. If you do employ an IEP, simply provide us with the protocol and lab results and we will gladly provide you with a free remediation estimate (within our service area). Free visual non-invasive inspection of the area(s) of concern (within our service area). Free proposal and estimate for mold removal (within our service area). Our mold remediation process removes even dead mold spores unlike many companies that just fog or spray the contaminated area. Even dead mold spores can be toxic so it is important to ensure all mold (living and dead) are properly removed. If an Indoor Environmental Professional (IEP) is employed by you, our mold team will follow the remediation protocol that is provided to us. The mold removal process typically begins by containing the affected work area to ensure unaffected areas of the property are not cross contaminated as a result of our work. Following containment, all effected, non structural building materials such as affected drywall, insulation, trim, carpet, etc are removed, bagged and discarded. Structural materials such as wood sheathing, studs, sill plates, interior masonry walls, etc are wire brushed, scrubbed, sanitized to remove the mold. During the process we use HEPA Filtration devices to eliminate the presence of mold spores as well as specialized cleaning techniques, equipment and industrial strength anti-microbial solutions to complete the remediation process. Fungicidal protective coating application to minimize future mold growth in treated area. 100% guarantee to pass mold clearance tests that will be performed by an independent Indoor Environmental Professional (IEP)! You don’t pay the balance due unless we pass the clearance test. IICRC certified (now called The Clean Trust) to ensure mold is properly removed. Mold depends on moisture for survival and grows in environments where it is dark, no air movement, organic food is present (paper, wood), and the moderate temperature is 68°-86°. Within 24-48 hours under ideal conditions mold will grow. 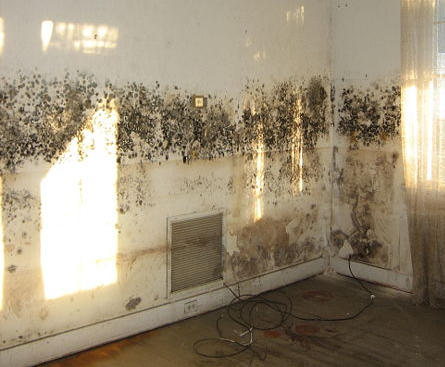 Mold develops where there is excess water and moisture. The most effective way to protect your family and property from the threat of mold is to have it dried immediately by a professional mitigation company. PuroClean offers mold removal services to stem the tide of mold, as well as cleaning and sanitation, including mold and mildew odor removal to restore your home or business to its original state. Our professional deodorization techniques erase mold and mildew odors. Removal of mold and mildew can be a serious endeavor, and PuroClean has the expertise and technology for the job. The first step in any mold remediation, and a crucial step, is to deal with the underlying water situation. Mold is always related to water, so a search for mold will always begin by using professional meters and expertise to look for unwanted water under cabinets or inside of walls, etc. If the source of the water is not fixed, then mold will return regardless of any effort by a remediation company. The property owner should be offered the opportunity to consult with a qualified Indoor Environmental Professional (IEP) who can help evaluate the situation and who will write the protocol that the remediation professional will follow. It is impossible to determine the type of mold by looking at it. Stacybotrys is black, but so are many other species of mold. If someone wants to know the specific molds present then a sample must be sent to a qualified laboratory for evaluation. The standard we follow allow the professional remediation company to deal with small areas of visible mold without the necessity of requiring an IEP. When the area of visible mold is larger, then they do require an IEP to be involved in the process. 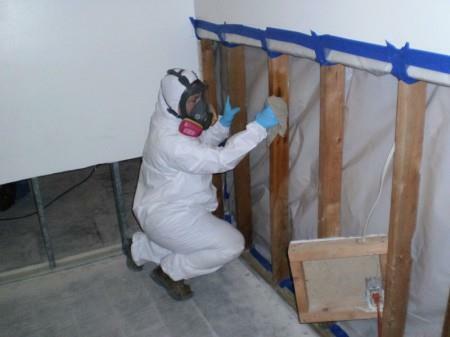 For a remediation professional, it is important to treat every mold contamination as a serious matter. Mold should be remediated and the environment returned to a dry state. Remediation efforts are the same, regardless of the type of mold involved. Remember, the professional is treating all mold as hazardous, so the procedures and processes and safety precautions are the same in most cases. At the end of every mold remediation, regardless of the size of the restoration, a mold test should be taken by a qualified mold testing company and sent to a laboratory for analysis. The reasonable standard that is normally used to evaluate the sample is that the mold counts be “less than outdoors.” Since we live in an interactive world and the “outside” comes in every time we open the door, the fact that our remediation area is less than the outside indicates that the remediation was successful.